Among ZBAG employee perks is the opportunity to go on local kayak trips with co-workers. 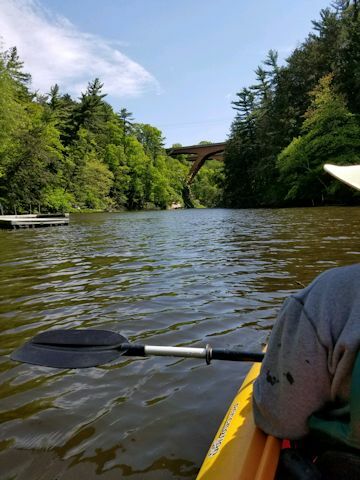 On a sunny summer day, it feels good to leave the manual transmissions behind and head out for an afternoon of paddling down the Zumbro River in the company of like-minded people. Hosting the trips are Steve and Susan Goldammer, both ZBAG employees who love being on the water in a kayak or canoe, and want to share their enthusiasm with the people they work with. “Our trips usually have around twenty people,” Steve commented. “If there’s a threat of rain, we don’t get quite as good a turnout.” Goldammers have equipment to share, and are eager to introduce novices to the sport. “We collect canoes and kayaks,” Steve confessed. “We have seventeen of them.” He and Susan bring as many of them as they need to outfit the group for a trip down the river. The Goldammers like to provide the right piece of equipment for each participant. “If you go double, you get to sit close together,” Steve said. Being out in nature is a good way to refresh the mind, and much different than rebuilding a manual transmission. He and Susan like to encourage the kayaking, along with other group activities, to help strengthen and solidify relationships within ZBAG. “We want our co-workers to see ZBAG as a place that has a like-minded group of employees who can have fun together,” he explained. The person floating on the water will be back on the job Monday morning, rebuilding differentials, manual transmissions, or transfer cases, pulling parts, or doing customer service, but in a better state of mind and body after paddling on the Zumbro.